I'm currently trying to understand the mechanics behind diffraction and gain a better understanding of the Huygens–Fresnel principle, but I've reached a hurdle that is making me question my understanding of refraction. As I understand, refraction is a phenomena caused by light-matter interaction; when a light wave is incident on a material, its electric field component excites the particles that make up the material, which leads to emission of new EM waves. The Huygens–Fresnel principle makes sense to me, here, as the particles become radiators, and they radiate new EM waves in all directions. So with this understanding, the bending of refracted light makes sense: when an incident wave is at an angle that isn't 0 degrees, the incident wave will interact with the particles at the surface, in a sequential manner. This is what causes the refracted light to bend from the normal, as the excited particles behave like a phased array, where they emit new EM waves sequentially. Note that the above understanding is for refraction only. I am aware that the overall transmitted light is made up of the refracted light and (some of) the incident light. With diffraction (using the single split experiment for simplicity), the wave is partially absorbed and partially transmitted. The form of the transmitted wave is not the same as the original, due to interference caused by the new wavelets, emitted at each point of the wavefront. The transmitted part does not interact with any particles (I'm ignoring atmospheric particles), so from a physical perspective, what are these emitters (at each point of the wavefront/the yellow dots in the image above)? And what causes them to emit new wavelets? For refraction, the emitters are the particles that make up the material, and they emit new waves due to their interaction with the incident wave. So I understand how the Huygens-Fresnel principle works with refraction, I'm just not sure why I should consider every point of a wavefront to be a source of new EM wavelets with diffraction. So as you can probably tell, my understanding of refraction is causing confusion with diffraction, which, in turn, is making me question my understanding of refraction. Is my understanding of refraction correct? Are the points referred to by the Huygens–Fresnel principle actually the particles that make up the material for refraction? What's the deal with diffraction? The Huygens–Fresnel principle is applicable to both vacuum and non-vacuum media, i.e., there does not have to be any underlying material with physical particles like electrons in it. 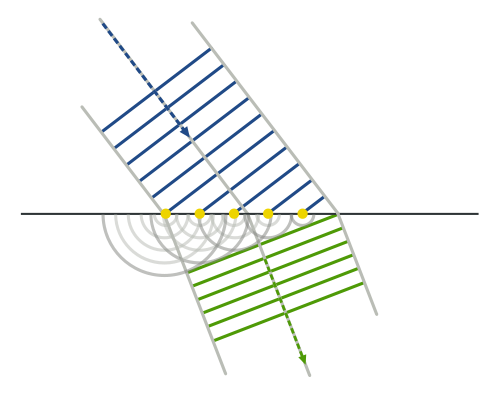 It is more of a geometrical concept that shows how the propagation of a wave could be predicted by treating each point of the wave front as a new wavelet source. It does not say that these sources really exist. The only characteristic of media that needs to be taken into account to predict refraction using Huygens–Fresnel principle is the wave propagation speed, which could be different for different media, the speed in vacuum, c, of course, being the fastest. I think your confusion centers on the idea of "emitters". Huygens' principle does not require actual emitters; it simply states that each point on the wavefront acts like a new spherical wavefront emitter, and wavefronts downstream act as if they are the linear sum of the wavefronts emitted by those imaginary upstream emitters. Light propagating in free space without any obstacles obeys Huygens' principle. If a wavefront is blocked anywhere by a mask with a pinhole aperture slightly bigger than a wavelength of the blocked wave, a very nearly spherical wave emerges on the downstream side of the aperture. That observation is the foundation of Huygens' principle. It really does not matter what the mask is made of. You are completely right. The light interacts with the electrons in the screen. If the screen is completely closed, this generates an induced wave that is opposite in phase with the incident wave, so that the sum is darkness (a shadow). When there is only a small obstruction (a hair or a thin copper wire), this will create a diffraction pattern according to Huygens principle, with the points in the wire as emitters for the induced field. Now there is Babinet's principle. 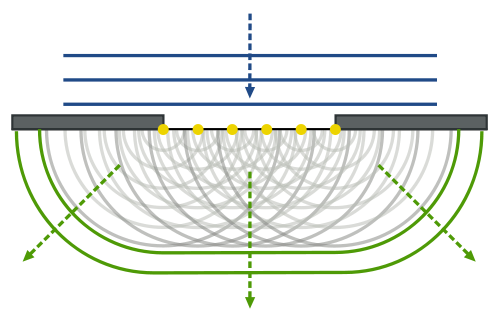 A wire is the complement of a screen with a slit. The induced fields of these are opposite in phase, but otherwise identical. So the standard treatment of the slit is a shortcut. It is not practical to do the integrals to infinity of the screen from the edges of the the slit. Babinet tells us that one gets the same intensity profile. Not the answer you're looking for? Browse other questions tagged optics waves refraction diffraction huygens-principle or ask your own question. How does Huygens Principle incorporate the unidirectional property of a traveling wave? What is the basis of Huygens principle? Is Wikipedia wrong about Huygens-Fresnel Principle? Huygens Principle, what's the benefit to this interpretation? What is the reason behind diffraction of light?